The previous post provided details of the custom Scotch Bar being made for JLT's office. 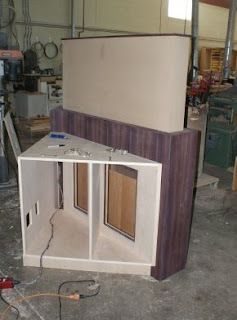 This next post will show the work in progress on the motorized T.V. cabinet we are making for the same space. Since the T.V. 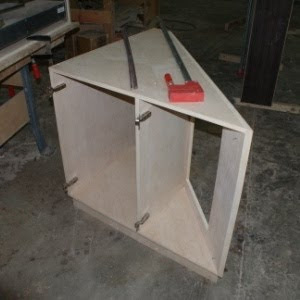 needs to be angled into the room, this special triangle shaped cabinet had to be made. 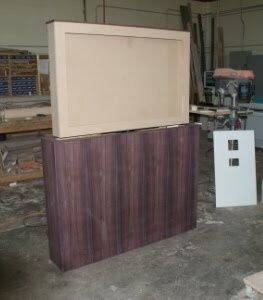 This cabinet will house the electronics, with the openings in the back meant to receive access panels that will allow for future service - if required. 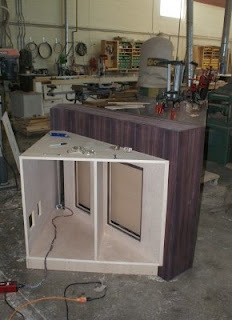 This is the main cabinet that will house the T.V. lift mechanism. 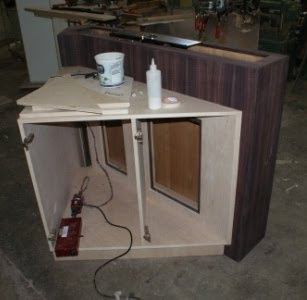 The cabinet exterior is crafted from East Indian Rosewood panels that have been secured together with glued rabbet joinery. Once the glue has dried some inlay beads of solid Rosewood will be precision fit into the corners. 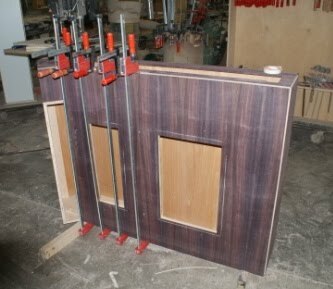 This image shows the two cabinets joined together. 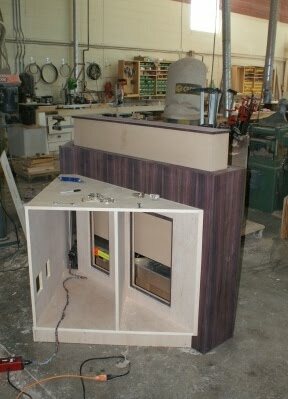 The vertical channel at the back left of the cabinet allows the cables to move freely with the lift mechanism as it travels up and down. These images show the lift mechanism going through a dry run. Cut outs for outlets and data cables have been added to the left gable, based on site measurements taken earlier. 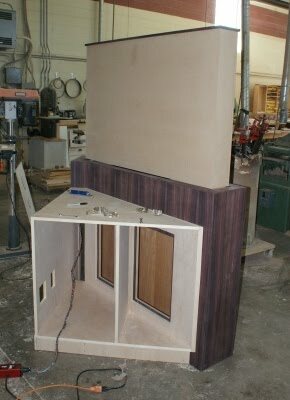 The recessed base will be clad in stainless steel, and a black granite top will be made for the triangular cabinet. This shows the T.V. 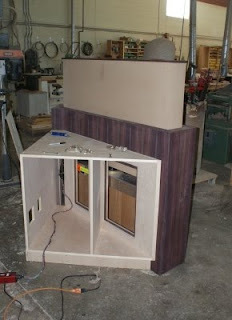 cabinet from the opposite side. The lift cabinet enclosure will be finished in satin black lacquer, with its removable front panel being shaped as a template that will be custom fit around the T.V. after installation. By the way, did I mention that the T.V. also rotates? It does, but that's not the best part. It turns out that the coolest feature of this project is the Savant wireless control system that's being installed which will allow all electronics in this office to be run off an IPad.